Today in hockey history, a tie paves way for a very depressing Stanley Cup Finals, some unruly behavior in Canada, Gretzky extends his record, a player extends a record very similar to the one by Gretzky, and the decision is made to play games outside the continent for the first time. March 26, 1919 – The Montreal Canadiens and Seattle Metropolitans battled to a 0-0 tie in a Stanley Cup Finals match. 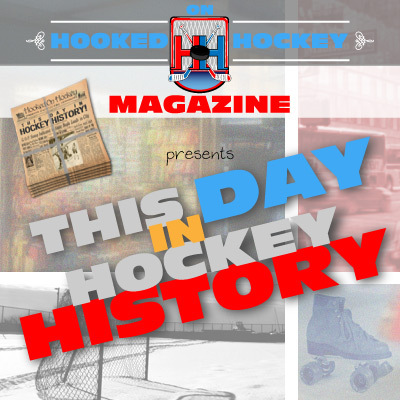 Back then, games ended after just one 20-minute overtime period, and Montreal’s Georges Vezina and Seattle’s Harry Holmes stopped every shot in Game 4 of the first-to-three series. And that’s how the championship would end, too. In a tie. Due to an outbreak of the flu, most players became sick and the deciding game and the series had to be cancelled, ending with no champion after five games of play (each team went 2-2-1, so the series would have been decided if not for the tie). Canadiens defenseman Joe Hall actually passed because of pneumonia (caused by the flu) shortly after the fifth game. Not many positives going on there. March 26, 1964 – In a 2-0 Montreal win over Toronto in Game 1 of the Stanley Cup Semi-Finals, the rivals set a playoff record by recording 31 penalties, breaking the record of 29 set by Toronto and Detroit eight years ago. To be expected, I suppose. March 26, 1991 – In a 2-0 Kings win, Gretzky extended his NHL record by scoring against his former team, the Oilers), to record his 12th consecutive 40-goal season. As if having a single 40-goal season wasn’t hard enough. March 26, 1994 – Gretzky might have the record for consecutive 40-goal seasons, but not for 30-goal seasons. Toronto’s Mike Gartner scored twice a 6-3 Leafs win over the Nordiques to record his 15th consecutive 30-goal season. It might not have been 40-goal seasons, but that consistency is incredible. March 26, 1997 – The NHL announced that the Anaheim Mighty Ducks and Vancouver Canucks would open the 1997-98 season with two games in Japan, marking the first time in league history that regular-season games (games that actually counted) would be played outside North America.